With the super engineer bracelet this guy weighs a ton. I have got some nato straps on the way, when I swim I prefer a bracelet however. I have also sold off the VAST majority of my pocket knives (I think I’m down to 3) and with some of the proceeds have ordered a watch which reflects my enthusiasm for election tampering. Did you advertise them here? 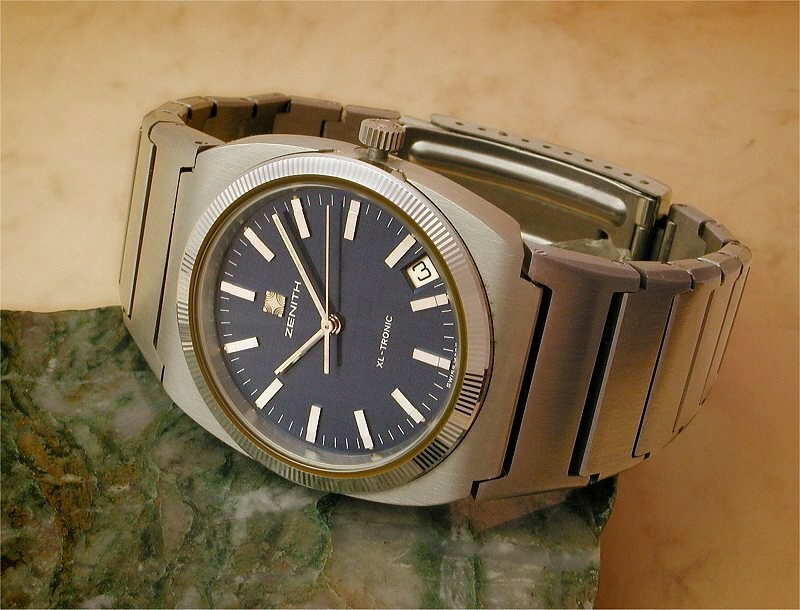 A Zenith XL-tronic with a tuning fork movement. Whoops, sorry guys - this was meant to be in the watch thread - Maybe you could fix for me, @Mark1966 ? Hope in the one you wanted! Nice. Recent acquisition? I always feel that Zenith's are underrated in the horological world. Anyone able to recommend a reputable pocket watch restorer in Shitney? Inherited two pocket watches that were my Grandfathers and want to do the right thing, in getting them up and running again, particularly the NSWGR one. Couldn't agree more, Eggs. Zenith is pretty much my favourite brand. I acquired the XL-Tronic in the early '00s. See below my most prized Zenith - love my Chronomaster, with the brilliant El Primero movement. Guy in Enmore (Newtown) is highly regarded. 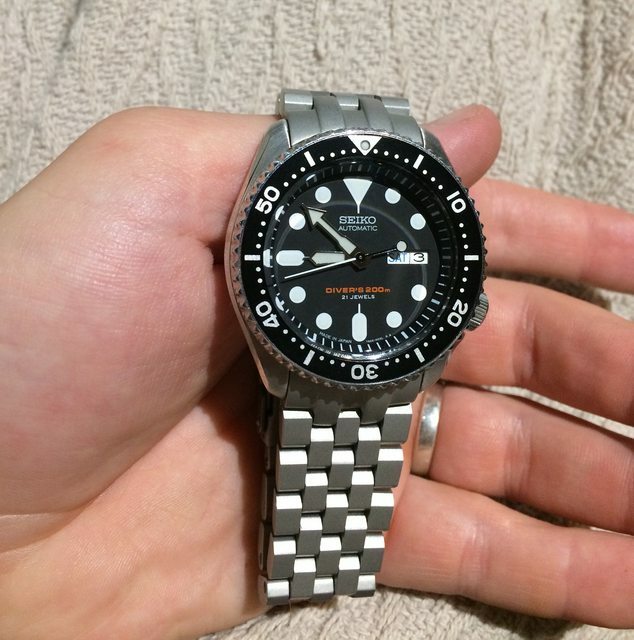 So much so he is a registered Seiko part supplier (which is rare). 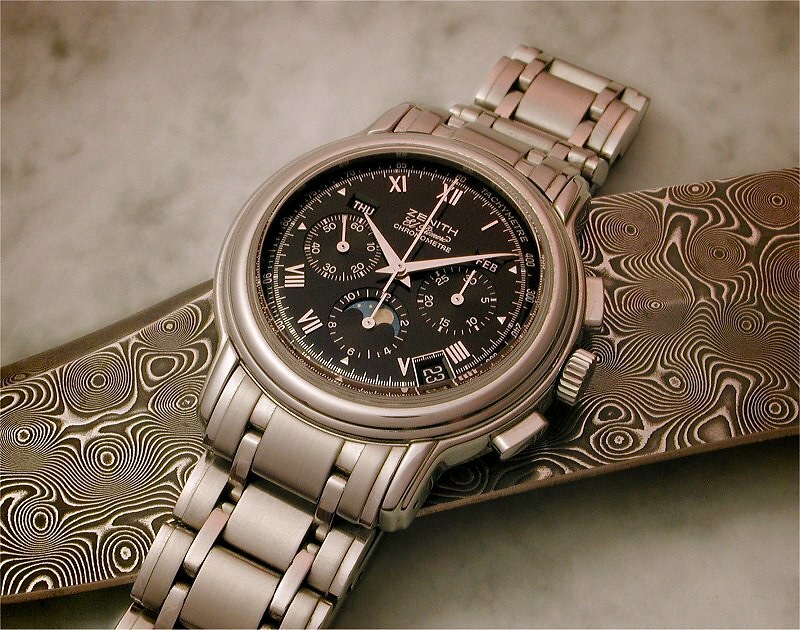 Lovely watch and also a Zenith fan though more interested in the object supporting the watch. Is that metal? And if so what technique was used to make that pattern besides the obvious bend and fold please? He's a collector too, so will seek his advice first upon what is legitimate and also worth restoring. Will also follow up the above lead for a second opinion. G'day Rusty. 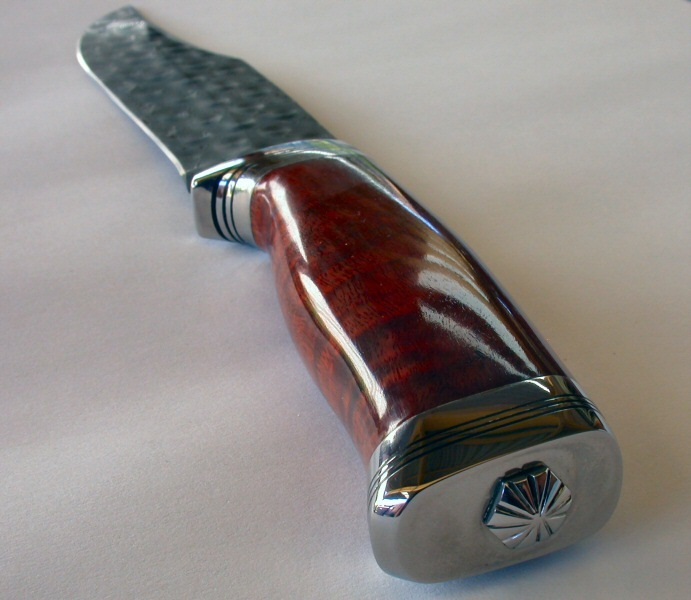 It is a custom Damascus knife made by renowned Knife maker David Brodziak of Albany, Western Australia. Blade: All Stainless Damascus in raindrop pattern hardened to Rockwell 58. @TomG can you please take one for the team so that we need never hear about polsilvers again? They're just too good for that! I don't buy good watches any more as I lose them. Several Seiko's, G-shocks, a Citizen or two, Swatches (when I was much younger), a Tissot T-touch and a Heuer (pre Tag) chronograph have all slipped through my hands at one stage or another, so instead I buy at the opposite end of the range compared to many of you here. Last year I had the urge to buy another auto as I really wasn't impressed with the Vostok Amphibia I own, so I hunted high and low for something of value. I just about managed to stop myself from pulling the trigger on several great deals advertised on Watchuseek because they either had zero water resistance or were realistically above my price range. 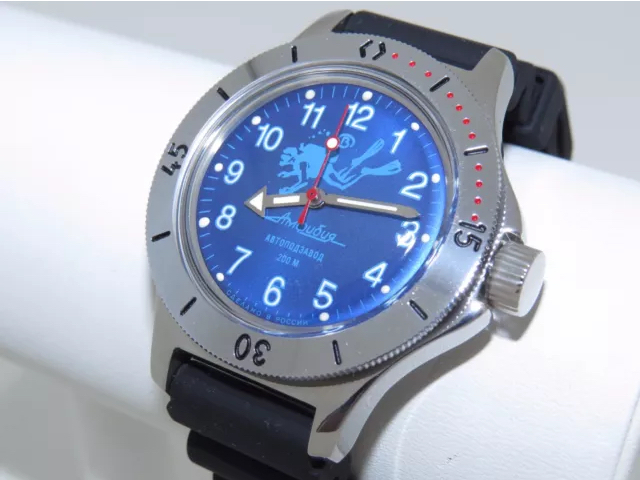 Eventually a deal popped up for an Invicta 892x (can't remember the model number but its the blue version of the 8926ob) - cheap, bombproof, reasonable movement - in short a watch I wouldn't be afraid to wear and wouldn't care too much if I dinged it when out in the field. For what it is, it's a nice watch. There are a few little things about it that I'm not particularly happy with - INVICTA engraved into the side of the watch case, and some of the embellishments on the dial are a little over the top for my liking but nothing that bad. However it really has pretty bad timekeeping as it runs a minute or more out per day, which considering it's a Seiko NH36 movement is quite disappointing. I know it probably only needs some regulating done, but I have no idea how to do so, and don't want to jump down a warren of Youtube videos, getting sucked in to needing to buy more and more stuff to make the watch run as it should so thought I would ask here is regulating easy, and do really I need extra equipment? My GD350 G-Shock keeps time within 10 seconds per year, which is pretty amazing in my book. It also wakes me up with a vibe alarm without waking anyone else, which is the main reason I have it. Just replaced the battery myself ($2) following online instructions after a few years of regular daily use of the vibe alarm. I previously had a Tissot analog (quartz self winding) for 20 years but then I broke the integrated bracelet. Now I have a vibe alarm though, there is no way I would go back. I use it for everything from timing food in the oven to regulating screen time for the kids. It rocks! Never heard of raindrop damascus before, absolutely beautiful. Hardness rating is impressive for damascus steel, is there a harder centre core? VG10 Steel cutting edge is hard HRC 61 , but the harder the steel the more brittle it will be.